Now that details about Intel's upcoming Skylake-X LGA2066 processors have been officially announced, we can finally reveal some of the new motherboards that ASUS has designed for this new HEDT X299 'Basin Falls' platform. As we have come to expect from ASUS there is a diverse range of models split between the Prime, TUF, and ROG series. Although we don't yet have access to full specifications lists, given the capabilities of the Skylake-X processors - like a quad-channel memory controller and up to 44 PCIe 3.0 lanes - all of the motherboards share certain obvious characteristics like eight DDR4 memory slots, a ton of PCIe slots, at least two full-speed M.2 slots, and both 8-pin and 4-pin CPU/EPS power connectors to handle the elevated power draw of high core count processors. Since it is the feature du jour all of the models also have some form of AURA RGB LED lightning. 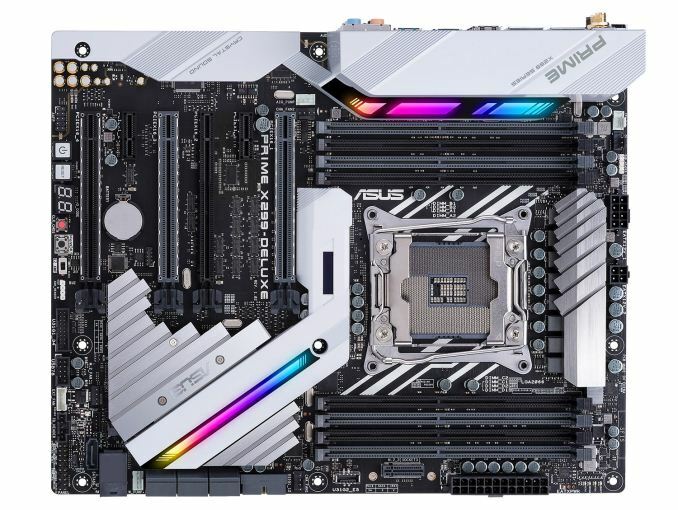 As you will see below, with so many PCIe lanes coming from the CPU and even more from the chipset, these X299 motherboards have an unprecendented amount of expansion and storage connectivity. 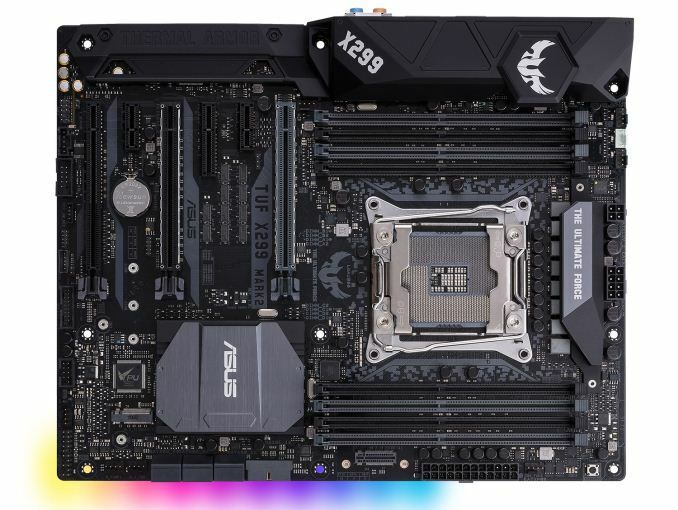 Since it is the backbone of the ASUS motherboard lineup, let's start off with the Prime series which will initially consist of the higher-end Prime X299-Deluxe and more affordable Prime X299-A. 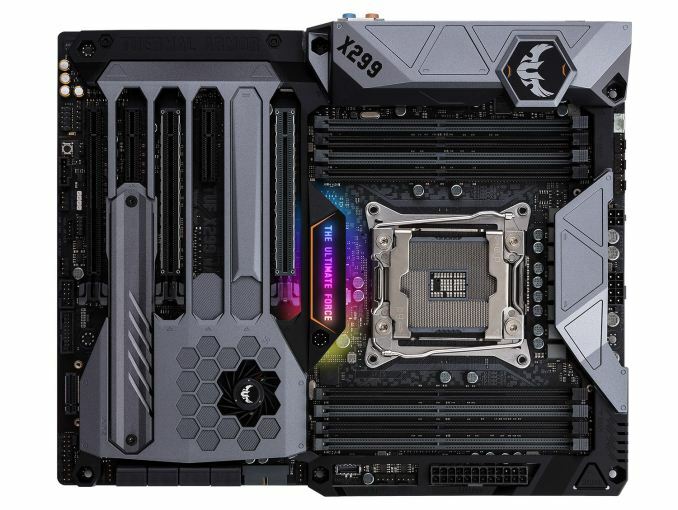 The Prime X299-Deluxe - pictured above - is a standard ATX form factor model that carries over the black and white aesthetic of its forebearers, though with some fancy new flourishes. It has an 8-phase digital CPU power design managed by some variant of the DIGI+ PWM controller. There are both 8-pin and 4-pin CPU/EPS power connectors, which should come in handy if a high TDP 18-core Skylake-X processor is installed. There are Japanese 10K capacitors used throughout the motherboard, not counting the Nichicon audio-grade capacitors used in the onboard audio section. The eight Q-DIMM memory slots are clipless on one side, and they can handle up to 128GB of quad-channel DDR4 memory. No word yet on what the highest supported overclocked memory speed is for this model. 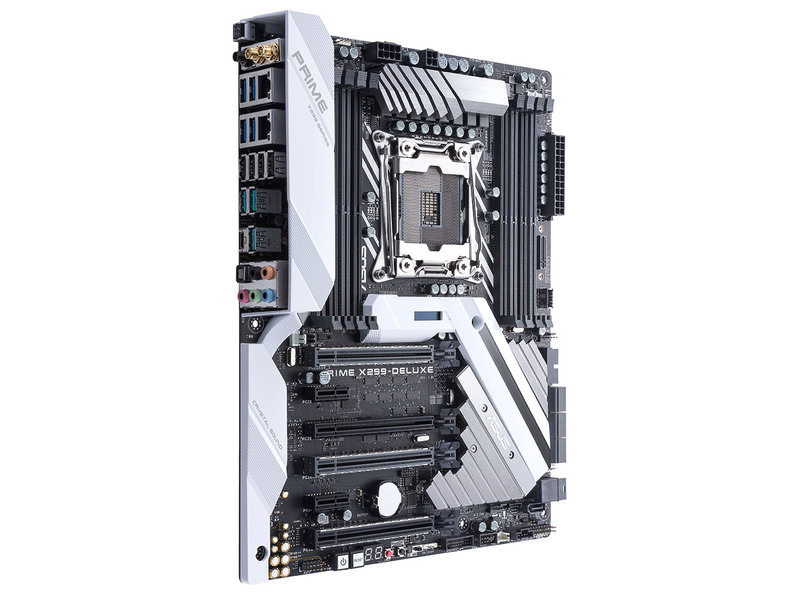 While this motherboards has four mechanical PCIe x16 slots, only the two grey ones are actually x16 capable. The middle slot is limited to x4 and the bottom slot is limited to x8. This means that the X299-Deluxe will 'only' be able to handle three-way graphics configurations. Three of the four PCIe x16 slots have been given the SafeSlot treatment, which is to say that they have been mechanically reinforced with steel and additional anchor points for superior retention and shearing resistance. There are also two PCIe x1 slots. Storage connectivity appears quite good with six SATA 6Gb/s ports, one U.2 port, and two M.2 slots that support SATA, PCI-E, and PCI-E NVMe M.2 solid state drives. Intel's new Optane Memory technology is also supported. One of the M.2 slots is under the large chipset heatsink and the other is next to the right bank of memory slots, and has been designed to hold M.2 drives vertically. In addition, the motherboard supports six USB 2.0 ports (four rear, one header), eight USB 3.0 ports (four rear, two headers), and six USB 3.1 Gen2 ports (four rear, one header). Focusing on the full-speed USB 3.1 Gen2 ports, there are three Type-A ports and one Type-C port on the rear I/O panel, and a USB 3.1 Gen2 front-panel internal header next to the memory slots. If that wasn't enough, ASUS are also including their ThunderboltEX 3 add-on card, which means Thunderbolt 3 capabilities, 40Gbps transfer speeds, and 36W of power delivery to external peripherals. When it comes to networking, there are two gigabit LAN ports powered by some variant of Intel controller, and an onboard dual-band Wi-Fi solution that supports the new 802.11ad protocol and is capable of theoretical tranfer rates up to 4.6Gbps. The onboard audio duties are handled by a new Crystal Sound implementation, which features a Realtek S1220A codec paired to an amplifier, Nichicon audio-grade capacitors, and a PCB-level audio isolation line. If you want a motherboard that looks even better than it sounds, the highly customizable Aura Sync RGB LED lighting feature is well-represented on this model. There are unique-looking and independently controllable light bars integrated into the rear I/O shield and the chipset heatsinks, there is a 4-pin header that can power RGB LED light strips, and thanks to Aura Sync you can synchronize the colors and effects of compatible products to match that of your motherboard. While we are on the topic of aesthetics, one of the more unusual new features is the OLED screen has been integrated into the chipset heatsink. Known as LiveDash, it is capable of displaying system information like temperatures, frequencies, and fan speeds, or it can display custom graphical animations or text messages for no other reason than to make your build unique. Rounding things out are the usual assortment of value-added features like the USB BIOS Flashback feature, Q-Code Debug LED, diagnostics LEDs, onboard power and reset buttons, clear CMOS button, EZ_XMP switch, MemOK! button, and the EXT_FAN header. That last header is important because it leads us to the fact that ASUS is also bundling their Fan Extension card, to further expand the X299-Deluxe's already generous assortment of CPU and system fan headers and temperature sensors. When it comes to the Prime X299-A - for which we have no picture - this model omits a few of the extras found of the Deluxe model in order to reach a more affordable price point. However, it will have the same 8-phase digatal CPU power design, it will also support up to three-way graphics configurations, it will have two M.2 slots, and have similar if not identical storage and USB connectivity. The onboard audio solution should be identical as well. When it comes to differences, we expect this model to only have one gigabit LAN port, and to also not feature any onboard Wi-Fi solution. It should have a more simplistic chipset heatsink and be missing at least one of the two integrated light bars. However, it will have two RGB LED light strip headers instead of the one on the Prime X299-Deluxe. Needless to say that we don't expect the ThunderboltEX 3 add-on card or the Fan Extension card in this model's accessories bundle. Moving on to the TUF series, these models prioritize reliability and durability thanks to tougher components and more stringent testing. This series is comprised of the TUF X299 Mark 1 and the slightly stripped down TUF X299 Mark 2. Like previous TUF Mark 1 motherboards, this TUF X299 Mark 1 model features a protective armor and advanced cooling options. Not only does the cover prevent dust from accumulating on the board, but it helps direct the integrated fan's airflow to the proper areas, like towards the primary M.2 slots. Speaking of fans, there are four fan headers near the CPU socket and six other spread throughout the motherboard. In order to manage thermals you need to be able to monitor temperatures, and this model takes care about with a number of onboard temperature sensors that monitor seperate zones on the motherboard and then feed that data into the Thermal Radar 3 utility. The TUF Detective mobile app returns, but this serving as a wireless means of diagnosing and monitoring the system via a smartphone. Although not visible, the Mark 1 features a Fortifier backplate, which ASUS claim is their strongest one yet. This metal plate serves to stiffen the motherboard against warping, but it helps dissipate heat from various thermal hotspots that can appear on the back of the PCB. ASUS has also included a removable GPU Holder that can support the weight of a graphics cards, and prevent strain on the PCIe slots. When it comes to basic specs, this model shouldn't disappoint. It features same the 8-phase digital CPU power design and 10K Japanese capacitors as the two Prime series model. It has eight SATA 6Gb/s port and two M.2 slots. There is one USB 3.1 Gen2 header, two USB 3.0 headers, and one USB 2.0 header. While we do not have a picture of the rear I/O panel, we do know that this model has at least one USB 3.1 Gen2 Type-A port and USB 3.1 Gen2 Type-C port, as well as dual Intel-powered gigabit LAN ports. This motherboard has three visible PCIe x16 slots, only of two of which are actually x16 capable. Both of those PCIe x16 slots are steel-reinforced SafeSlots, which should protect them from the shearing effects of heavy graphics cards. The third PCIe x16 slot is limited to x8, which means that this model can still handle up to three-way SLI or CrossFire. There are two open-ended PCIe x4 slots which can physically support expansions cards with up x16 connectors. There is also one PCIe slot that is not visible to us since it is hidden under armor cover, but which is likely a PCIe x1 slot. There is RGB LED lighting integrated into the logo at the center of the board, and it will glow different colors based on the system load. If that is not enough lighting for you, there is also what appears to be a RGB LED light strip header at the very bottom of the motherboard. Rounding out the known features list is an onboard power button, a MemOK! button, and diagnostics LEDs. The more affordable TUF X299 Mark 2 strips down some of the Mark 1's unique features to create a more conventional motherboard. Much like the Prime X299-A is to the Prime X299-Deluxe, this model delivers much of the same functionality, but at a more affordable price. ASUS has done this by removing the protective armor and the backplate. It also loses two SATA 6GB/s ports - down to six total - and one of the PCIe x4 slots has been swapped for a PCIe x1 slot. There is also no USB 3.1 Gen2 front-panel header on this model, and the total fan header count has been reduced from ten down to seven. 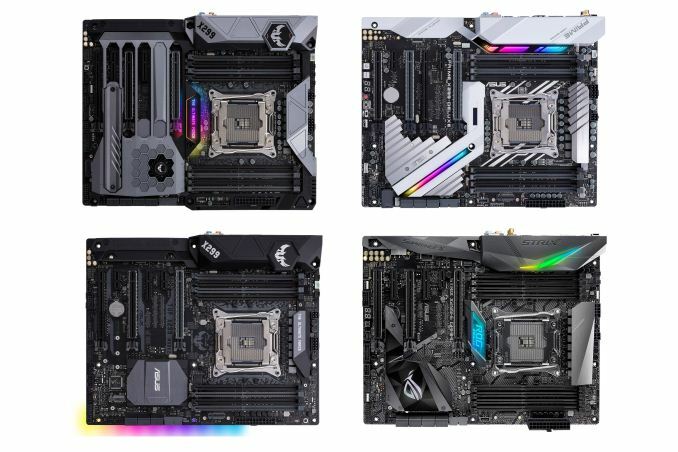 On the plus side, the TUF X299 Mark 2 appears to have greater onboard RGB LED lighting, with LEDs mounted under much of the right side of the motherboard. However, there does not appear to be an LED light strip header anywhere on the Mark 1. FWIW, WCCFtech has a picture of what's supposed to be the Strix's rear IO. Assuming the picture is valid, each 'header' referred to in this article refers to a pair of ports not 1 for a total of 8 (7xA, 1xC); which is a much more reasonable number of ports for a high end board (even if there is room for a few more due to the lack of other IO).